They come from Somalia and Myanmar, the Congo and Bhutan and Vietnam – and they all end up in Arizona. More than 15,400 refugees from 42 different countries were resettled in Arizona from fiscal 2012 through the just-ended fiscal 2016, according to the State Department’s Refugee Processing Center. A former postal services manager at Northern Arizona University is accused of embezzling nearly $355,000 from the school over a span of 15 A? years. The change coming to the Arizona Supreme Court might be more than just a couple of new faces. 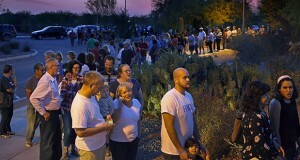 Arizona's most populous county has agreed to develop a plan to avoid polling place wait times to settle a lawsuit a civil rights group filed after thousands of people waited for hours to vote in the March presidential primary. The Arizona Democratic Party is suing Secretary of State Michele Reagan for refusing to extend the state's voter registration deadline by a day even though it fell on a state and federal holiday. A dark money group urged the Arizona Court of Appeals to allow it to challenge the Citizens Clean Elections Commission’s authority to levy a $96,000 fine against it after a judge ruled that it missed the deadline for filing an appeal, a case that could settle the long-running dispute over the extent of the commission’s jurisdiction. A judge presiding over a lawsuit that protests how Arizona carries out the death penalty extracted promises in court from the state Wednesday that it won't use the sedative midazolam in future executions. Arizona Gov. Doug Ducey has appointed a Maricopa County Superior Court judge to an open seat on the Arizona Court of Appeals.